SLR-107CR - 7.62x39 caliber, stamped receiver, chrome lined hammer forged 16.25 barrel, 24x1.5mm right-hand threads on front sight / gas block, removable muzzle nut, Plum polymer furniture, Warsaw Pact length left-side folding buttstock with compartment for cleaning kit, stainless steel heat shield, 2-stage trigger group, 500m rear sight, and side rail for attaching optics. Comes with one 10-round magazine, sling, oil bottle, and cleaning kit. 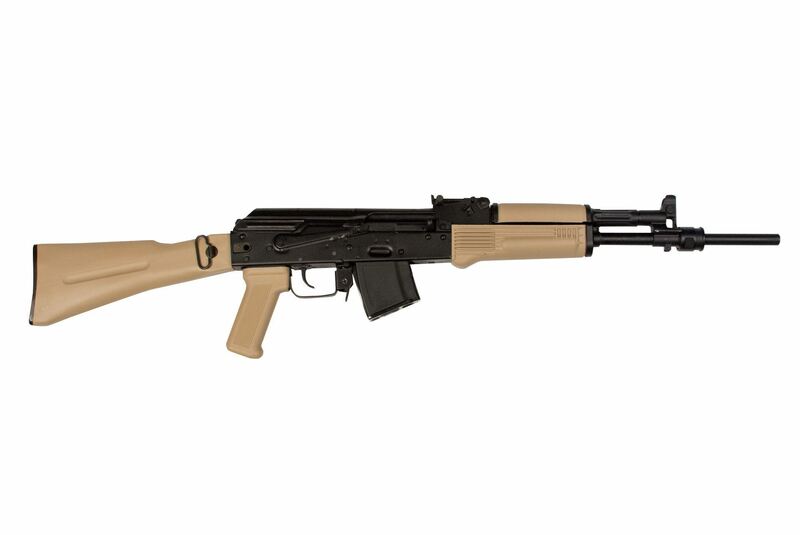 The 7.62x39 caliber SLR-107CR is a top notch, stamped receiver, semi-automatic modern sporting rifle manufactured in Las Vegas, Nevada, utilizing only the best and authentic Arsenal factory components, such as the front sight / gas block combination. It is manufactured with a Bulgarian made Arsenal mil-spec 1mm stamped receiver and cold hammer forged and hard chrome lined barrel. The authentic US made components, such as the anti-slap double stage trigger group, mil-spec polymer stock set, Warsaw length left-side folding polymer buttstock perfectly complete this rifle for unparalleled quality and accuracy. SLR-107CR - 7.62x39 caliber, stamped receiver, chrome lined hammer forged 16.25 barrel, 24x1.5mm right-hand threads on front sight / gas block, removable muzzle nut, desert sand polymer furniture, Warsaw Pact length left-side folding buttstock with compartment for cleaning kit, stainless steel heat shield, 2-stage trigger group, 500m rear sight, and side rail for attaching optics. Comes with one 10-round magazine, sling, oil bottle, and cleaning kit.